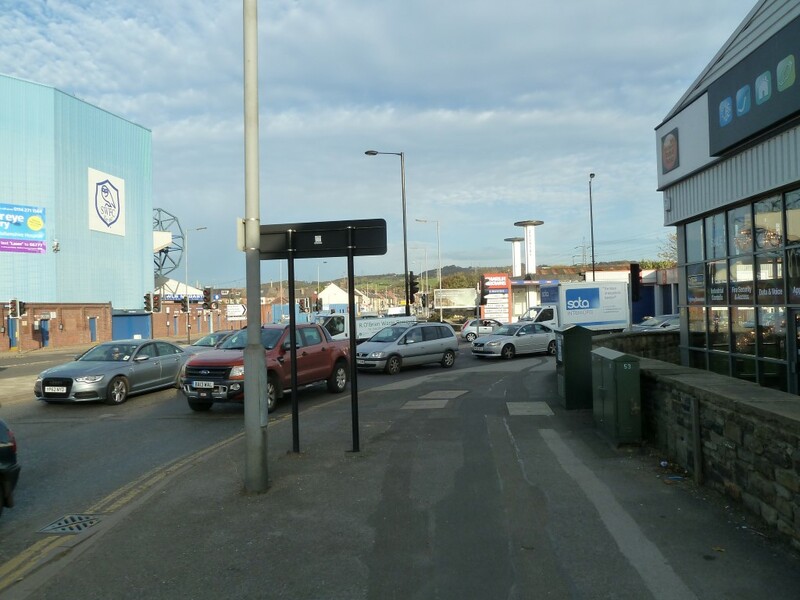 Next week Leigh Bramall is due to make a decision on whether to compromise a cycling route. He has two options. Option 2 – Abandon the original plans, leave the manoeuvre permitted, permit vehicles to turn into the junction 100% of the time in direct conflict with people crossing on bike and foot. Don’t provide a toucan crossing and make the central island a bit bigger instead. So, we can either give people who walk or bike a green signal 75% of the time with no delay and no conflicting movements. Or we could just say “forget them”, and not put in a crossing at all and allow conflicting turning movements 100% of the time. There’s a crossing underneath there somewhere. No need for crossing signals? The officers at the council are recommending abandoning the plans because it will delay traffic too much and businesses think people need to be able to drive everywhere using the shortest route! Surprise surprise! 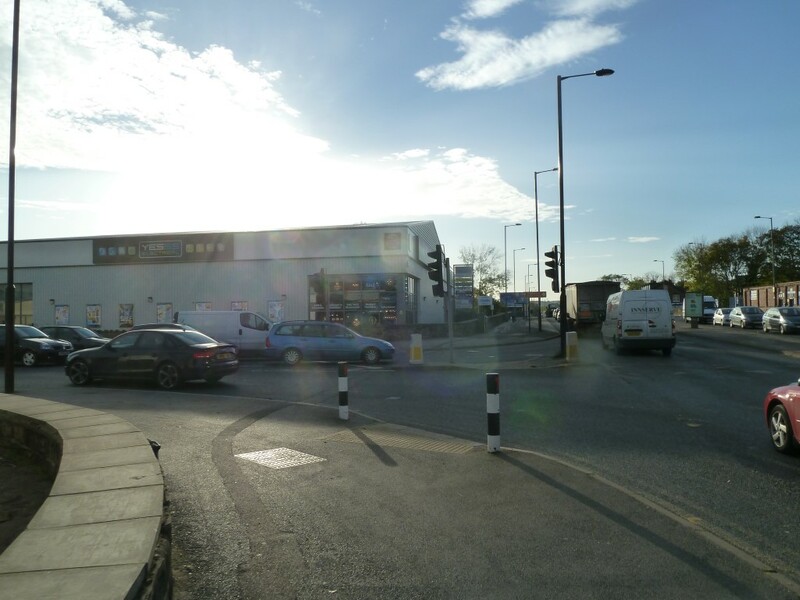 The prohibition would enable the road layout to be amended so that a pedestrian and cyclist demand-stage could be incorporated into the traffic signals phasing without adversely affecting the main A61 corridor. It would also mean, however, that traffic travelling to businesses on Herries Road South, or wishing to travel back north via Herries Road South and Herries Road, would have to travel a longer and arguably more tortuous route. Without the prohibition the road layout could not be appropriately changed to incorporate an additional demand-stage without adding a signal stage, which would have a negative effect on the operation of the traffic signals. This would lead to estimated increases in journey times of up to an additional 56 second per vehicle. This junction is on a route designated by our statutory local plan as a cycling route to be improved and yet council officers are recommending compromising the safety and convenience of anyone using it on a bike. Why do we even have to campaign on a route that is designated as such in the local plan!? Apparently it is funded by the Government’s Pinch point fund which specifically for tackling motor vehicle congestion not for cycling provision. If cycling had been included we would not have secured the funding. I think it must be remembered that this scheme is being largely funded from the Government’s ‘Pinchpoint’ programme, which as the name implies is aimed at relieving localised congestion. How is this fair? Providing signalised junctions for motor traffic, but neglecting to do so for anyone on foot or on a bike? Why does motor traffic get to have a traffic light phase but other users don’t, they’re just being abandoned at the place where they need protection the most, at busy junctions! Leigh, if you approve this, then you might as well tear up your transport policy, your cycling policy and your planning policy. You’re sending out a very clear message that cycling is not important and that Sheffield Council simply don’t give a damn about anyone not in a car. Update 20th March 2015: A couple of months ago now I attended a meeting with Leigh and a few engineers where it was explained that there would not be a signalised crossing put in place here. They think that by banning the left turn, it would be too hard to drive to adjacent properties and a £200,000 roundbout would need to be installed at a location a little bit further up the road to mitigate. And they think that by putting in an on-demand push button crossing that this would cause excessive delay and congestion and tailbacks. So, the decision has been made to not put a signalised pedestrian/bike crossing here. This entry was posted in Penistone Road on November 8, 2014 by Matt. The item has been pulled from the meeting agenda tomorrow, pending a meeting with CycleSheffield, we’ll see what happens. Janet Bragg and the Council Officer are simply wrong. It isn’t a case of it being fair, or asking for something extra. Improving cycling provision is expressly INCLUDED as a fundable measure to reduce congestion through the Pinch Point Fund. 15. The Fund is designed to promote economic growth through the rapid deployment of schemes that remove transport barriers or prevent the emergence of new transport barriers. Eligible schemes should be those that provide new or improved links to key economic sites (such as an Enterprise Zone, development site or urban employment centre), or which tackle congestion or address the condition of highway structures that are near to the point of becoming a barrier to access. **Investment need not be restricted to roads and can include investment in cycling and bus infrastructure to help reduce congestion on road networks and/or demonstrate the links to growth. ** The DfT funding must only be used for expenditure that qualifies as capital. Hi Eric, thanks very much for this. It could be really helpful.